Presumably meant as a way to improve investment opportunities into the upcoming Kindle Fire tablet and other related products, Amazon has spun that device and the Fire brand into a new company called Seesaw LLC. 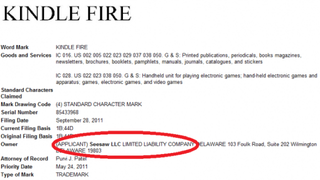 Amazon has not made any public comments yet, but its trademark filings have confirmed that the company did indeed file the Kindle Fire and Amazon Silk browser with the United States Patent and Trademark Office under the name Seesaw LLC, not Amazon. There were five trademarks filed in all, and each was submitted by the same attorney who has conducted Amazon's other filings to date, one Purvi J. Patel of Haynes and Booone, LLP.